CeeVee is the UK distributor for Finnish company Hogfors, the 455/465 V port ball sector valves are well proven in difficult applications, V port ball valves provide accurate control with high flow and low pressure drop making them perfectly suited for applications with solids in suspension as found in the paper industry. CeeVee will size valves to suit customer parameters. 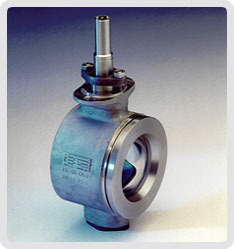 We carry valves in stock for rapid delivery. High-performance butterfly valve, made of stainless steel.